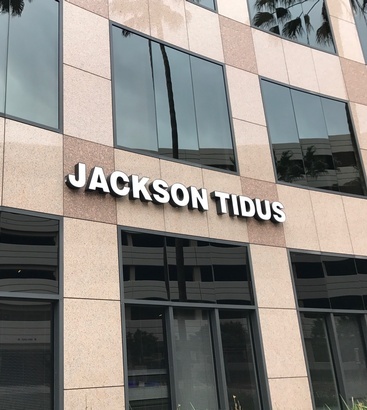 Jackson Tidus is a preeminent California full service law firm, providing practical and cost effective legal solutions. Our objective is our clients' success - not just in legal matters, but in the achievement of their broader goals. We believe in the value of establishing close relationships with our clients and that their interests are best served by developing and nurturing collaborative partnerships. Together, we pursue the most favorable outcomes available in matters of business formation and organization, trademark and intellectual property rights, mergers and acquisitions, litigation, tax and estate planning, employment law, business immigration, insurance coverage, environmental law, subdivisions, land use, and real estate.